In the latest issue of Science (Oct 4th, 2013), there is a forum paper with some suggestion for the management of fires and forests in the face of changing climates . Basically, the authors suggest that policy focused on fire suppression only delays the inevitable, promising more dangerous and destructive forests fires. They emphasize the importance of strategically managing wildfires and the use of prescribed fires in combination with mechanical fuel treatments to create fire resilient landscapes. In addition, the journal Frontiers in Ecology and Environment has recently published an special issue on prescribed burns in different ecosystems worldwide . Fires are very important processes on many ecosystems [3,4], and what is important is to shape fire regimes to be sustainable (socially and ecologically). A zero-tolerance fire policy (which still dominates in many countries) cannot work in the long-term, especially in seasonal climates, as the high fuel accumulation coupled with a warming climate may drive the system to large and intense fires that threaten both people and biodiversity; and this may occurs despite major economic investments in fire prevention and suppression. 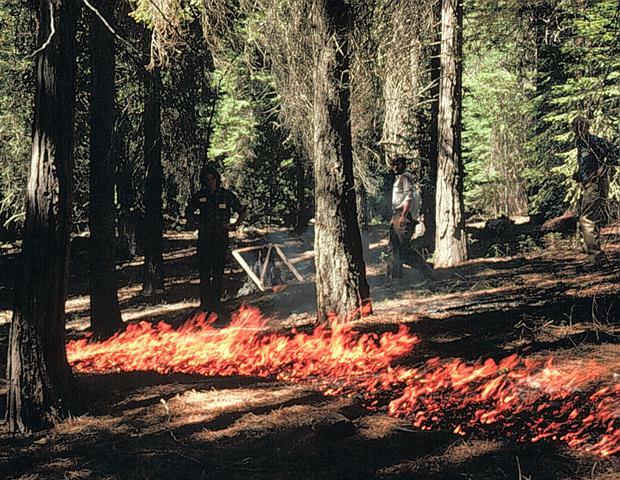 Foto: Prescribed understory burn of a mixed conifer forest in the Sierra Nevada, California. From . Stephens, S.L., Agee, J.K., Fulé, P.Z., North, M.P., Romme, W.H., Swetnam, T.W., Turner, M.G., 2013. Managing forests and fire in changing climates. Science 342, 41-42.